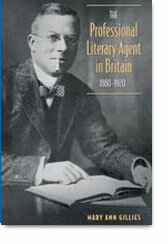 THE NEED FOR a study of the rise of literary agents in England towards the close of the nineteenth-century and their profound impact on writing of all kinds, but particularly on the emergence of Modernism, has been a longstanding one. This monograph makes stabs in the right direction but is neither the comprehensive nor definitive work its title so boldly suggests. Gillies opts to focus on only two well-known agents, A. P. Watt and J. B. Pinker, and to present case studies for clients of each: for Watt, George MacDonald and “Lucas Malet” (the former now little known and the latter wholly forgotten), and for Pinker, Somerville and Ross and Joseph Conrad. Watts did have some big fish in his net, including Kipling and Wilkie Collins, although his list has on the whole worn less well than Pinker’s whose clients make up a pantheon of the literary elite, including Stephen Crane, Arnold Bennett, Ford Madox Ford, Henry James, John Galsworthy, Katherine Mansfield. Among other clients, H. G. Wells and D. H. Lawrence quarreled with him, while James Joyce invoked his name in the Circe episode of Ulysses. Gillies’s case studies scrupulously maintain gender balance, with one male and one female writer per agent (counting the Irish collaborating cousins Somerville and Ross as an entity), an even-handedness deriving more, perhaps, from current preoccupations with political correctness rather than the realities of the late nineteenth-century literary marketplace. The procedure involves amassing a wealth of detail about a writer of scant interest (Malet) mainly to score the small and obvious point that Watt flexibly dealt with clients, male and female. The account of Conrad’s massive career, so generously enabled by Pinker, is consequently foreshortened, handled in cursory outline rather than in depth, with some highly familiar territory traversed along the way. In her introductory chapter, Gillies laboriously establishes her rationale and positions her work in a field that has witnessed intense growth over the past two decades. This is followed by a summary, if quite useful, discussion, of the several changes on the publishing scene in late nineteenth-century Britain. She then argues that, although many of the essential services were the same (selling copyrights, placing work, advising on work-in-progress) for both agents, there were two stages in the development of literary agency: an initial, more conservative one, pioneered by A. P. Watt, who made his services available mainly to writers of some reputation and cozied up to publishers; and a second stage, initiated by Pinker, who more adventurously sought out untried new talent and went to battle for it in the marketplace. Although the author claims in her Acknowledgments that this book was a decade in the making, some of her observations on A. P. Watt appeared in Publishing Research Quarterly as long ago as 1993. Given the time-span that this book was in planning and progress, the research energy on primary sources was not notably energetic, and it is surprising that the splendid collections of The Harry Ransom Center at The University of Texas have not been called on. Moreover, the claim, for instance, that little is known of A. P. Watt’s origins can be overturned by a ten-minute trawl in the online 1851 Census of Scotland, which establishes that his father was a “book agent” – an important point about the future literary agent’s background (one found, too, in the Oxford Dictionary of National Biography), and importantly coloring the later distinction that Watts hailed from the middleclass. Ten years later, Watt himself was working as a “Linen Draper’s Assistant,” a position that surely provided him with first-hand knowledge of how trade was pursued. For all its good intentions, this study seems undecided as to where its heart should lie. On the one hand, it considers Watt and Pinker as flesh-and-blood men not simply as companies, and family details are, indeed, mentioned, though not always accurately. Pinker’s wife’s name was Mary Elizabeth, not simply Elizabeth; the 1861 Census of England indicates that his Aunt Charlotte was a schoolmistress, not a governess as Gillies states (and as his Aunt Jane, in fact, was). Such subtle gradations count when discussing a highly class-conscious society, but, more importantly, neither man comes alive dramatically, and Pinker’s almost-rags-to-modest riches story, in particular, begs to be told as part of the social history often gestured towards but never truly grappled with. Potentially interesting and relevant information is, however, not given. Again, this is a question of intention, audience, scope of treatment, and research energy. Watt left almost twice as much as did Pinker, but the treasure trove of The Times or the DNB digital versions goes unexploited for these details. Present-day figures for pounds, shillings, and pence are left to the energetic reader to discover, and, similarly, W. Robertson Nicoll, a name no doubt familiar to paid-up specialists of the period, goes unidentified for the uninitiated. And it is good to know – as this study does not tell us – that Hugh Walpole wrote The Times obituary of Pinker cited here. There is a central vacuum as well. Where did all this take place? The locations of the agencies, passingly mentioned, arguably form a part of the context for a study of this kind: both were centrally situated, Watt’s in Paternoster Row behind St. Paul’s and long the very heart of London’s publishing business, Pinker’s in Arundel Street just off the bustling Strand, his premises shared by firms of architects and solicitors. The proximity of both Watt’s and Pinker’s to typing agencies, the popular press, and to the City also suggests how authorship was an activity demanding professional expertise and management as much as, say, stock-broking or banking, and, like them reliant upon a network of ancillary services, including the restaurants clustered in these areas where clients could be wined and dined. In the end, not determining a target audience for this book at its planning stages has ensured that it is yet another study destined for dust on the university library shelf. The real story to be told here, replete with a sense of period and place, is a genuinely exciting one – possibly rather too much so to be relegated to a tome published in Toronto’s “Studies in Book and Print Culture” series, whose twentieth-first volume this is.